Igor Boiko was born in 1961 in the city of Sumi, Ukraine. His professional career began in 1980 as guitarist with the Sumi Philharmonic Orchestra. At this time he felt a strong attraction to jazz and improvisational music. As early influences Igor lists Wes Montgomery, Joe Pass, and George Benson. 1981-1985 Army service followed by work in the army song and dance ensemble in Budapest. Toured Hungary and Austria with this ensemble. 1984 - First steps as a solo guitarist, playing in Budapest jazz clubs. 1985-1989 - Studied at the Glier Musical College (Kiev) in the guitar department. 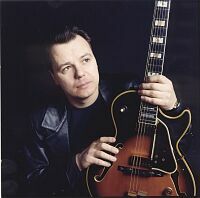 Under the leadership of well-known jazz guitarist and instructor Vladimir Molotkov, Igor learned the foundations of modern jazz improvisation. 1990-1992 - Worked with the Moscow Concert Orchestra under Anatoly Kroll. Established a musical partnership with jazz vocalist/composer Sergei Manukian. 1992-1993 - Lived and worked in Amsterdam. Artistic development enhanced by attending jazz festivals in Europe and working with American and European musicians. 1993-present - Living and working in Moscow. Frequent concerts with Sergei Manukian, participation in jazz festivals in Tallinn, Nizhny Novgorod, Ufa, Odessa, Moscow (2nd and 3rd International Jazz Festivals) and concerts in Kiev, Tomsk, Novosibirsk, Rostov-on-Don, Yerevan, and other cities of the CIS. 1995 - Igor featured as performer in the guitar show "Washburn Days in Moscow" organized by the company MUSIC BOX . 1997 Igor's first solo album - Bob's Your Uncle, released on Prestige Records, recorded at Soyuz Studio. Album released as part of an instrumental series called Best Guitarists. 1997 Igor accepts an invitation to join the pop group Valery Siutkin and Co. Records two albums featuring several of Igor's original compositions. 1998 - Igor performs new solo program at the 3rd international festival of jazz guitar "Baltica 98" held in St. Petersburg. 1999 - Played in Alexei Kozlov's group Arsenal. 1999 - Second solo album Time of Inspiration released on S&B Records. 2000 - Release of video entitled Music Box and Forte Club present Igor Boiko and Friends Live at Forte Club. Also released on video: The Six Strings of Igor Boiko containing excerpts from vaious concerts (Igor Boiko, Sergei Manukian, and Alexei Kozlov's Arsenal. 2000 - Publication of two-part instructional book "Improvisation on Electric Guitar." Part One - "Passing and Outside Tones in Improvisation"
Part Two - "Basic Chord Techniques"
For the past few years Igor has recorded with many different musical projects and is constantly on demand as a studio musician. In addition to maintaining a full concert schedule, Igor Boiko has also been active as a music educator. Since 1998 he has had a column in MUSIC BOX magazine - a master class on electric guitar improvisation called "Advice to guitarists from Igor Boiko." Other - Hughes & Kettner Tubeman guitar recording station. More info on Igor's instuments, musicianship, educational resources etc. coud be found on his page at Russian Guitar Portal. Book "Improvisation on Electric Guitar", Part One - "Passing and Outside Tones in Improvisation" Book "Improvisation on Electric Guitar", Part Two - "Basic Chord Techniques"
"Bob's Your Uncle", Igor Boiko, SZCD 0775-97 "Soyuz"
"Prestige-1: Xmas Night" Compilation. MC/CD,SZ 0881-97 "СОЮЗ"
"Not All..." Valery Syutkin SZCD 0921-98 "Soyuz"